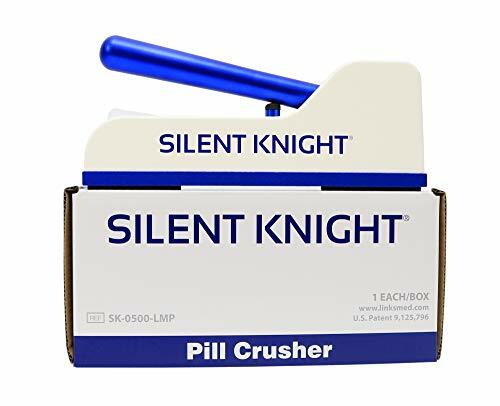 Save 1% on the Silent Knight Pill Crusher by LINKS MED at Get Cheap Health Insurance. MPN: SK0100. Hurry! Limited time offer. Offer valid only while supplies last. Silent Knight Pill Crusher The Silent Knight Pill Crusher crushes pills quickly with minimal force and quietly so it doesn't disturb residents. Silent Knight Pill Crusher The Silent Knight Pill Crusher crushes pills quickly with minimal force and quietly so it doesn't disturb residents. Disposable pouches help prevent cross contamination of different medications. The Silent Knight pill crusher can also crush pills to a fine particle size, to prevent clogging of feeding tubes. If you have any questions about this product by LINKS MED, contact us by completing and submitting the form below. If you are looking for a specif part number, please include it with your message.